Ammunition is vital in order for a firearm to work properly. Keeping your ammo stored in a location that is dry, easy to access, and safe is something all responsible gun owners should practice. There are many ammunition storage units on the market that help fit the individual needs of the vast variety of gun owners. Ammo storage is simply anywhere you want to keep your ammunition. It can be a variety of different objects and places: belts, bags, cases, etc. Ammo storage is often very different because it needs to accommodate a wide range of bullet calibers. How you need or want to access your ammunition can give you a better idea of the type of ammo storage you will want to acquire. If you are looking to access your shotgun ammo quickly and efficiently, a shell carrier might be the right ammo storage solution for you. Separate individual shells can be easily strapped to your belt for convenient use. If you do not want to carry the ammo on your person, a buttstock pouch could be the item you are looking for. Larger boxes are made so you can safely store large quantities of ammunition in a weatherproof container that is easy to carry. These boxes come in different sizes and can hold calibers of all kinds. If you are looking for something with a shoulder strap, a shell pouch offers the same size box, but with a strap carrying option. 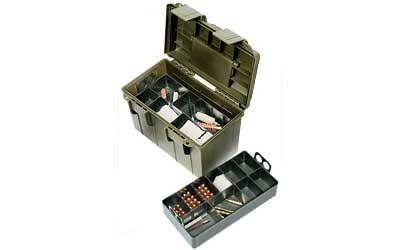 People wanting to properly store and sort their ammunition will want to look at the ammo storage options available. GrabAGun.com has a large selection of smaller holders as well as bigger pouches that will help fit the needs of the various gun owners out there.